Can’t go a day without chocolate? 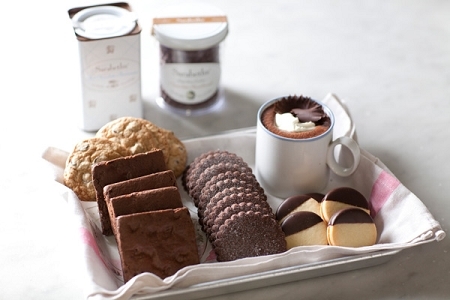 Then this premier assortment from Sarabeth’s Bakery will satisfy your craving. One jar each of Chocolate Chip and Chocolate Shortbread Cookies, six No Nut Brownies, one dozen Chocolate Marmalade Cookies and one 12 oz. tin of Hot Chocolate Parisienne.